Review, Approve, Edit, Delete, Create Daily Activities on the Kinderlime website. Also add activities from previous dates! On the Kinderlime website you can review the day's activities and choose to approve, edit or delete them. You can also add new daily activities! Go to Parent Connect --> Daily Activities (circled in orange below). You will see the Activity Feed of children's activities. Use the link at the top to switch to the Daily Summary view (indicated in blue). Activities that need approval will have an indicator on the left side of the screen (see red arrow). Click the child's name to see their activity details. 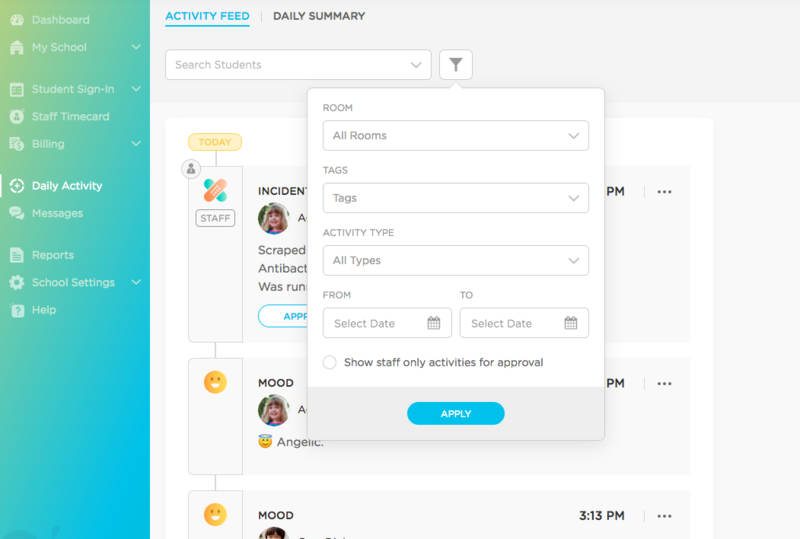 Filter for previous days; specific rooms, tags, or activities; individual children; or activities waiting for approval using the filter icon. Follow the directions in the sections below to approve activities, edit/delete activities, or add new activities. Click on the name of the child to see the details of the activity that requires your approval. Review item and click "Approve" button to send that activity to the parents (their app will automatically be updated). Click on the child's name to open their activities. Find the item and use the ellipsis (...) on the right side to edit or delete (see red arrow in screenshot below). Deleting or editing an item will also delete or change that item in the parent's app. Click "+New Activity" on the top right of the page (see red arrow below). Select the child(ren) and click "Create Activity."